Located on the first floor. Individual bathroom with shower and toilet. 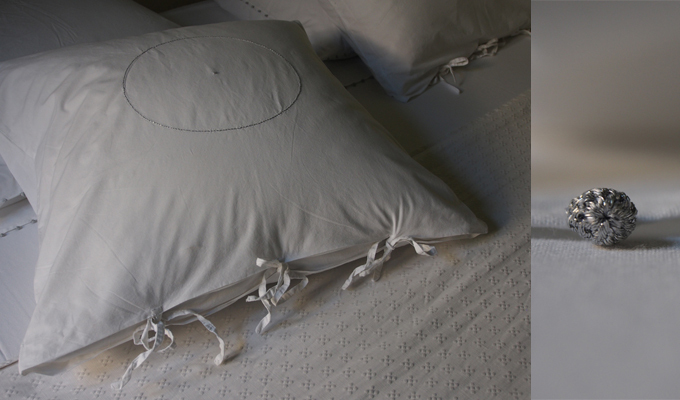 Exclusive bed and bath linen, duvet and pillows made of feathers. 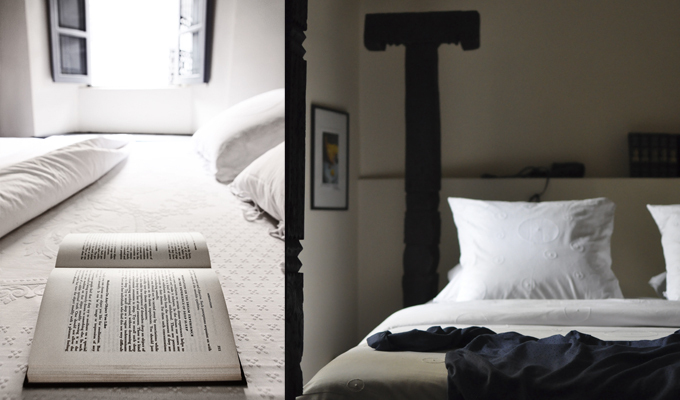 The Bed is a design of Ministro del Gusto. The Double Room Baboune is definitely the cosiest of Dar Kawa. Once the blinds open, the sun peeps through the traditional window and the light is magnificent during the afternoon. The double room Baboune is in the right wing of the house. 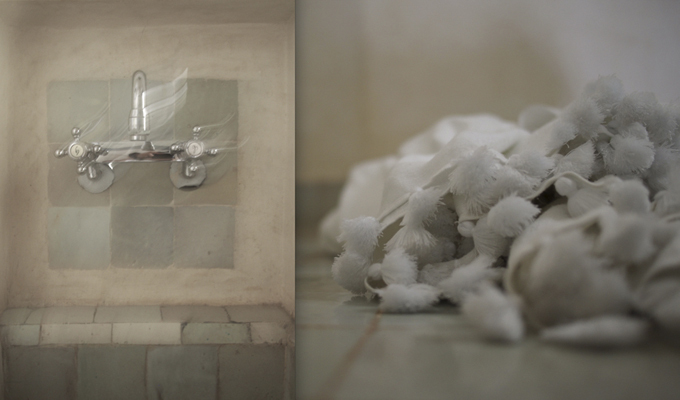 A comfortable room, it is decorated with linen entirely signed Valérie Barkowski. 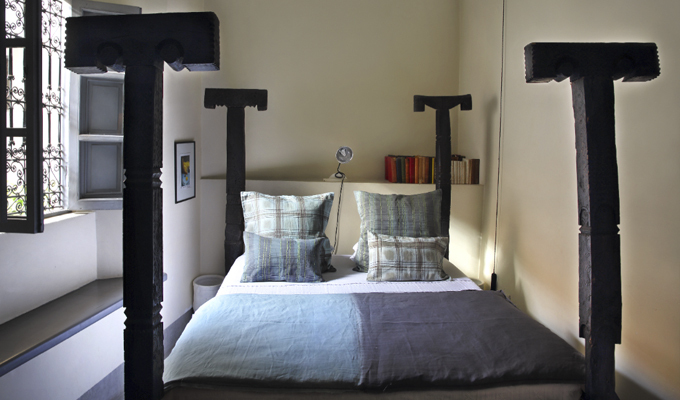 Cushions and the duvet are of feathers and the bed itself is a unique creation of Ministero del Gusto made from four pillars of old Berber tents, this piece adds character to the interior design of the room. There is a attached bathroom with shower and toilet. Some styles were designed years ago, others were born a few months back. All are timeless, have a high quality, are made with handmade finishes by artisans. 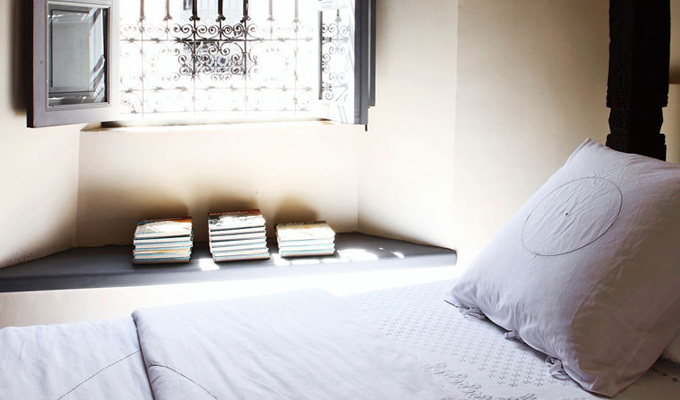 The bed and bath linens are even customizable. 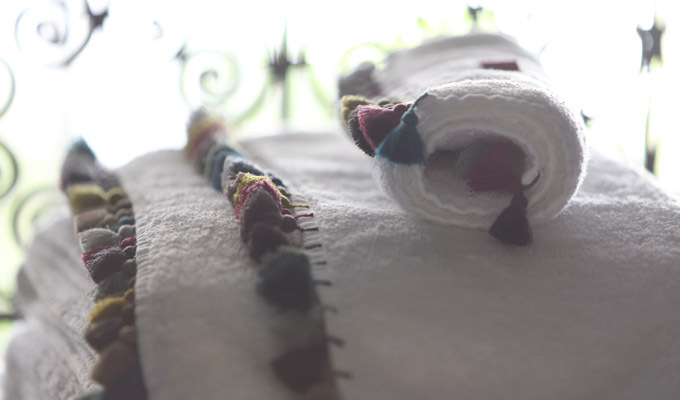 A selection of these linens can be ordered while you are staying in Dar Kawa. 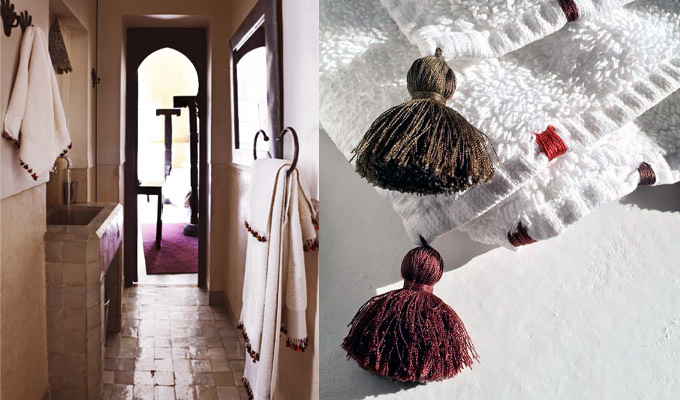 The staff, or Valérie Barkowski herself, if she is in Marrakesh, will be happy to help you place your order. Check in time : 2.00 pm. Check out time : 12.00 pm. 30 days before arrival 30% of full rental amount is due. Between 30 and 15 before arrival 50% of full rental amount is due. Less than 15 days before arrival 100% of full rental amount is due. Departure before the end of your stay 100% of full rental amount is due. Airport transfer on request : 20 € per multiple of 2 people. We request you to send us your demand at least 48 hours before arrival by sending us your flight details.